Erythema Multiforme: It is a Hypersensitivity Skin reaction which is caused due to the deposition of immune complex Immunoglobulins IgM in the superficial Blood vessels of the Skin and Oral Mucous membrane. Erythema Multiforme is divided into E.M Minor and E.M Major and is distinct from Steven Johnsons Syndrome. Most common sites for the mucosal lesions are Lips, inside of cheeks and tongue. The other less common locations for the lesions are floor of the mouth, palate, and gums. The mucosal lesions appear as red swellings with blisters which break to leave an irregular shaped ulcers which are quite painful. 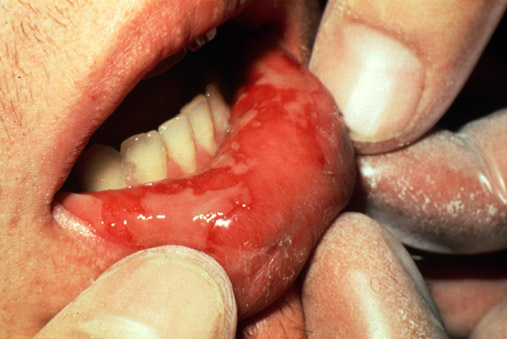 these ulcers are usually covered with pseudomembrane. It is a type IV hypersensitivity reaction which is caused as a result of infections, medications, and other triggers. It has a common recurrence with 1-2 times per year. The most common trigger for Erythema Multiforme is Herpes Simplex Virus infection (herpes labialis), it has been observed that Herpes infection can be seen 3-14 days ahead of the eruptions caused due to Erythema Multiforme. Apart from Medicines, there are Infections which have been reported to be a triggering factor for Erythema Multiforme like – Herpes Varicella zoster or Chicken pox, Parapoxvirus, adenovirus, Hepatitis, HIV and some Viral vaccines. Some fungal infections like tinea or Dermatohpyte fungal infections have been also reported to trigger Erythema multiforme. Erythema multiforme with mucosal involvement is now termed as bullous erythema multiforme. This type of Erythema caused due to administration of drugs for various health reasons should be diagnosed with care and the future treatment plan should be decided with the help of the concerned Physician by stopping the causative drugs and replacing them. For Oral lesions to decrease the pain and secondary infections prescribing Oral mouthwashes with local anesthetics and antiseptics can be useful.